The other night I was trying to convince my daughter that her ears should be washed when she pointed and said, "Mom, stop the duck from moving!" Her rubber ducky, a treasure from a the goody bag at her cousin's birthday, was aimlessly floating forward and backward, forward and backward. I thought to myself, what lovely example of harmonic motion! Of course, stopping the duck from moving while fulfilling the unspoken parameter of keeping it in the water is nearly impossible. The water is a liquid with millions of particles in motion. Stopping the duck completely would mean stopping the water. She likes her bath hot, not icy, and changing the liquid to a solid by cooling it would be the only way to stop the duck in the bath. So, I said, "Look!" and thrust my hand into the water near the duck. The duck moved away from my hand. I repeated it on the other side. Then she tried it. This trick produced the illusion of control that any healthy two-year-old craves, and negated the need for the ducky to actually stop. 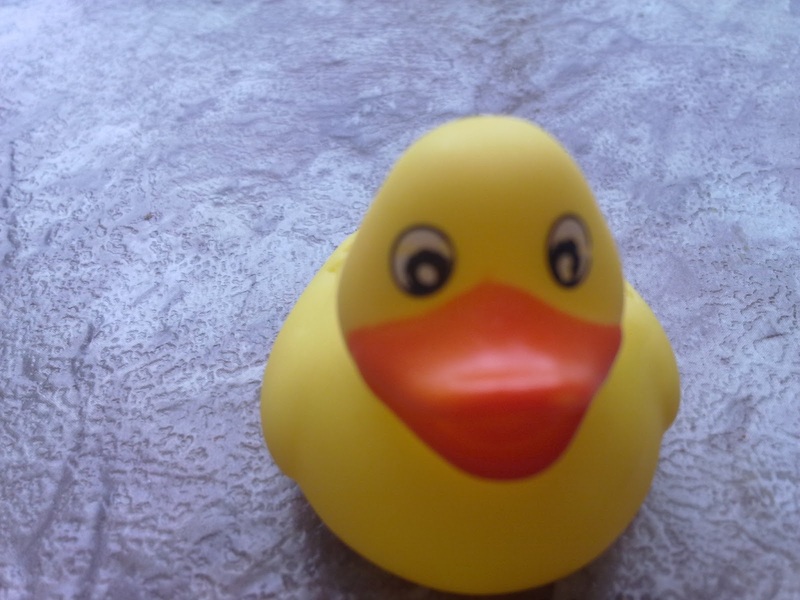 I explained that the water pushes on the duck, and that's called a force. I told her that her hand puts a force on the water and then the water puts a force on the duck. I might have dropped the the word bouyant (the type of force that pushes the duck up.) I might have said something about the water, her hand, and the her hand all taking up space. I just couldn't help myself. There's so much to say about a rubber duck in the bath tub. But, if I'd like to lecture about such things, I need to get back to the classroom and bigger victims. My sweet daughter just needed her bath, and some fun with mom. Then we tried to do as many other things as we could with the ducky in the water. It floated upside down, it sank. It floated just below the surface right side up. It squirted water out and took water in. Maybe she won't loose the wonder of such moments if I give the credibility. I hope not.